Formed in Jersey City, New Jersey, USA in the early 60s, Ronnie and the Hi-Lites were a doo-wop group best remembered for one recording, the 1962 US Top 20 ballad I Wish That We Were Married. The group, originally called the Cascades, initially consisted of tenors Sonny Caldwell and John Whitney, bass singer Kenny Overby and baritone Stanley Brown. Adding 12-year-old Ronnie Goodson as their lead singer, they were soon introduced to songwriter Marian Weiss, who offered them I Wish That We Were Married. The small Joy Records label picked up the demo recording the group had made and, renaming the ensemble, released the single. The group released only one other single for Joy and it was unsuccessful. They recorded a few more singles for Win Records, without success. Ronnie Goodson died 4 November 1980.
the Harptones, the Stereos, the Velours and the Wanderers, to name a few. In August of 1959, Cub issued an album, Sorry I Ran All the Way Home, which featured other recordings the Impalas made for the label. Unfortunately, no further hits ever came, and they disbanded in 1961. Ten hit that also became their second R&B Top Fiver in 1965. A couple of smaller hits followed later that year in "I Miss You So" and the pop/R&B Top 20 "Take Me Back." During the late '50s and early '60s, it wasn't uncommon to find doo wop and R&B singers recording and performing under numerous monikers, often trading out group members or substituting them at the last moment; everyone was expendable and no one person's identity created the group itself. The L.A.-based Jay Hawks were one of these acts and are best remembered for recording the original version of "Stranded in the Jungle" (1956), a novelty recorded by another group sharing its membership between two names/record labels, the Cadets/the Jacks. Carver Bunkum (bass), Carl Fisher (second tenor), Dave Govan (baritone), and Jimmy Johnson (lead) were high schoolers whose audition of an original, "Counting My Teardrops," impressed Flash Records' owner, who offered to put up the money to record it. It wasn't until their second Flash release, "Stranded in the Jungle,"
that the group became a success, drawing a lot of local L.A. airplay. "Stranded" was, incidentally, one of the first instances where a producer did what is called sampling; that is, the song included sound bites from other popular songs of the day, using the lyrics of these songs as news bulletins interrupting the verses. four R&B/number 15 pop in June 1956. Quick follow-ups by the Jaw Hawks -- including "Love Train" and the honkin' "Johnny's House Party" -- failed to chart, however, and by 1960, Bunkum had left the group to be replaced by Don Bradley (bass) and Richard Owens (first tenor). Along with the new group members came a new name. Feeling that they wanted to do more ballad material and that the name "Jay Hawks" was typecasting them as a novelty act, they decided to call themselves the Vibrations. They scored their own hit with the dance tune called "The Watusi" (number 25, 1961) for Checker Records. Meanwhile, multi-talented producer/label head H. B. Barnum had already produced "Western Movies," (number eight pop and number seven R&B) in 1958 for the Los Angeles-based Olympics, a flagrant Coasters'-style imitator/rip-off group. Barnum thought that the Vibrations were the ideal group to record another novelty tune he had co-written, "Peanut Butter," which he credited the tune to the Marathons. Unfortunately, Checker Records later discovered what was going on and brought a lawsuit against the group, Barnum and his record label. As the Vibrations' various members each had individual contracts with Checker, the label won the rights to market copies of "Peanut Butter" under their logo. Not to be denied, Arvee Records promptly secured the rights to the name the Marathons, rounded up some more singers to record "Peanut"'s successor -- including "Tight Sweater," written by a young Sonny Bono, as the group's follow-up -- and continued to push the novelty to the masses. Arvee then released a full-length LP of the Marathons' "Peanut Butter" and some other LP filler, but this recording failed to further the Marathons' name. By 1964, the real Jay Hawks/Marathons/Vibrations gradually turned to more romantic material, although their first hit, "My Girl Sloopy" (number 26, 1964) was closer to their previous cuts; they also recorded the "original" version of "Hang on Sloopy," which later would be a huge hit for the McCoys. The Jay Hawks/Marathons/Vibrations had their last brush with glory in 1968 with the Okeh Records-released "Love in Them There Hills." Richard Owens was briefly in the Temptations lineup in 1971, but returned to the fold with the Vibrations who continued on until 1976, closing out their career as a nightclub act. The Jesters' strong and vibrant street harmonies were an influence on groups for years to come, primarily in the 60s. 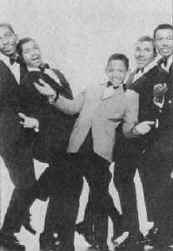 This doo wop group had a number one R&B (#3) pop hit 1961 with "My True Story," featuring the lead vocal of its writer, Eugene Pitt. Best known for the number one R&B hit "My True Story," the Jive Five were one of the few vocal groups to survive the transition from the '50s to the '60s. In the process, they helped move the music itself forward, providing a key link between doo wop and '60s soul. Formed in Brooklyn, New York, the group originally consisted of Eugene Pitt (lead), Jerome Hanna (tenor), Richard Harris (tenor), Billy Prophet (baritone), and Norman Johnson (bass). The Jive Five's first hit, "My True Story," was their biggest, peaking at number one on the R&B charts and number three on pop charts in the summer of 1961. None of the band's subsequent singles -- including the minor R&B hit, 1962's "These Golden Rings" -- were as popular, but the group managed to keep performing and recording. Under the direction of Eugene Pitt and Norman Johnson, the Jive Five refashioned themselves as a soul band in 1964, forming a new lineup with Casey Spencer (tenor), Webster Harris (tenor), and Beatrice Best (baritone). This new incarnation of the band signed to United Artists Records. The group only had one hit on UA, 1965's "I'm A Happy Man." In 1966, the Jive Five left United Artists and signed with Musicor, where they had the 1968 R&B hit "Sugar (Don't Take Away My Candy)." They changed labels again in 1970, signing with Decca. That same year, they changed their name to the Jyve Five, in order to appear more contemporary. The Jyve Fyve had only one minor R&B hit, 1970's "I Want You To Be My Baby."